Christmas joy expressed through music brings a message of peace and brotherhood for those most in need, Pope Francis said. “Christmas is a heartfelt feast, participatory, capable of warming the coldest hearts, of removing the walls of indifference toward one’s neighbor, of encouraging openness toward the other and giving freely,” he said Dec. 15. 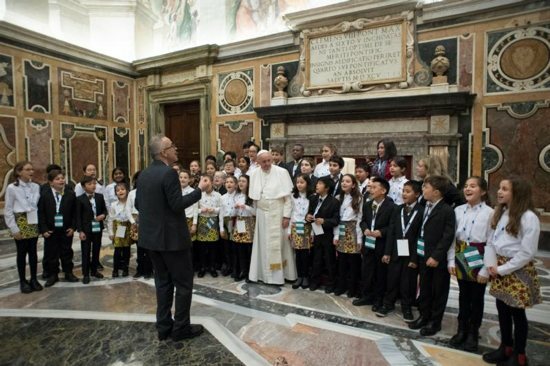 The proceeds of the Dec. 16 concert, which is sponsored by the Pontifical Congregation for Catholic Education, will be donated to two organizations — Scholas Occurrentes and the “Don Bosco in the World” Foundation — to benefit children’s programs in Argentina and the Democratic Republic of Congo. The pope thanked the artists and the event organizers for donating their time and talents to “the needs of the needy and disadvantaged who beg for help and solidarity” and for promoting peace and compassion through music. Pope Francis said he hoped the concert would be “an occasion to sow tenderness — this word that is often forgotten today. Violence, war, no! Tenderness! That it may sow tenderness, peace and hospitality which flows from the grotto in Bethlehem,” the pope said. Among the international cast of musicians meeting the pope and performing at the concert were Annie Lennox and Patti Smith.